« Was the Empty Tomb Story Originally Meant to be Understood Literally? Oh, I shouldn’t have . . . I gave myself Bart Ehrman’s new textbook, The Bible: A Historical and Literary Introduction, for Christmas. Here it is March, and I’m finally getting the chance to read it. I expect this overpriced volume has a pretty good chance of becoming the standard text in American undergraduate survey courses on the Bible. So it makes sense to find out what young students will be learning. When I say young students, I mean the young ones sufficiently well off to be able to live on campus. As education costs here in the U.S. skyrocket, more and more first- and second-year university students are working at night and driving to junior colleges each morning. But this book speaks directly to first-year students living in dormitories. The audience is more likely Footlights College Oxbridge than Scumbag College. Well done, Footlights! 10 points. Which king was better? That’s a toughie. But not as tough as the questions on University Challenge. Fortunately, when reading the core of the text, I can almost forget I’m reading a book targeted more at Lord Snot and Miss Money-Sterling than Mike, Rick, Vyvyan, and Neil. Unfortunately, it’s hard to overlook the mistakes I’ve found already in the early chapters. 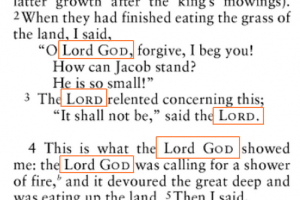 First of all, while it’s true that a few translations use all caps for “Lord” (especially in e-books and online) when referring to YHWH, it’s much more common for them to use small caps — Lord — rather than “LORD.” For example, in this image from the NIV, we see YHWH Elohim translated as Lord God. The initial large capital “L” retains the notion that we’re actually reading a proper name. So in this case, the Hebrew text would have the word YHWH, with vowel points that indicate the reader should say aloud, “Adonai.” But what would happen if the original text had “Adonai YHWH,” which is very common, for example, in the books of the prophets? Here we see what at first might look like a confusing hodgepodge. Sometimes God is in small caps with a preceding “Lord.” Other times, as in verse 3, Lord is in small caps. 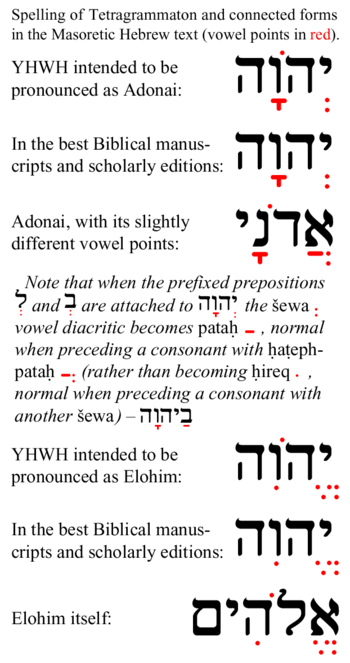 The rule is fairly simple: If the original Hebrew was written as “Adonai YHWH” (literally, “Lord Yahweh”), then the Masoretic vowel points around YHWH will indicate that it should be pronounced as “Elohim.” That is, rather than saying “Lord Lord,” they would say “Lord God.” In the case of the Oxford Bible, we know that any time we see a word in small caps (either God or Lord), YHWH is in the original text. We should note, though, that the NIV is a rare case. How rare? Well, I drew up a table that shows how YHWH is translated in Exodus 34:23. As you can see, English translations follow different standards. By and large, though, when the Hebrew text contains YHWH, the English translation will have Lord in small caps. On some occasions a translation will give the reader a hint that YHWH would be pronounced “Elohim” by writing God in small caps. The latter practice is the norm for the KJV and most of its descendants. You could argue that these are all small points, but Ehrman’s book is, after all, a textbook for university students. If it doesn’t matter whether we get things right here, then when does it matter? Very few English translations of the Bible write “LORD” in all caps. It’s much more common for them to use Lord in small caps. Several translations don’t always use Lord for every occurrence of YHWH. When Adonai comes directly before or after YHWH they write God instead. Are we supposed to imagine readers of Hebrew “sounding out” words phonetically as they scanned the text and thinking, “Wow, that’s hard to pronounce“? It is inconceivable that anyone at the time who was sufficiently fluent in Hebrew to be able to read it would not immediately recognize the divine name — יהוה — with or without the vowel points. Further, they would know not only that the name of God should never be uttered, but that its true pronunciation had been lost centuries ago. Ehrman’s difficulty-in-pronunciation theory is absurd. What the reader actually thought was this: “Here is the divine name. What word do I say instead? Let’s look at the vowel points.” And then he would say the alternate word associated with those vowels. יהוה Jehova, sive Adonay, quia Dominus es omnium. The word Jehovah, then, showed up first in Latin texts and eventually made its way into German and English. Referring back to the article in the American Journal of Theology, we see that Martin Luther referred to the name “Jehovah” as the equivalent of “HERR” (LORD). That statement is incorrect. It doesn’t help the student much to refer to the name of a book that did not exist in English translation. Wellhausen did indeed publish a work called Geschichte Israels (“History of Israel,” not “History of Ancient Israel“) in 1878. However, the book was republished in 1882 with the more familiar title, Prolegomena zur Geschichte Israels. It was this version that Black and Menzies translated into English in 1885, and is thus more commonly known to us as Prolegomena to the History of Israel. It makes no sense to say E or P “preferred” the name Elohim. After all, the law code in P is full of references to Yahweh. We read that the people should do this or not do that, “for I am Yahweh.” What’s important is the unique turning point in history when God appears to Moses in Exodus and reveals his true name, an event that has great significance in E and P. For the Elohist and Priestly writers, the revelation of the divine name occurs when God intervenes in history and establishes a special bond (a covenant) between himself and Israel. Misunderstanding the true significance of the usage of the divine name in the Pentateuch can lead to errors such as the common mistake concerning Genesis 7:1. Responding to blog readers who attempted to excuse Aslan as a non-expert in the field, Bart said that observation “was both obvious and unfortunate.” Similarly, one could argue that Ehrman is a New Testament scholar, and not really an expert in the OT. On the other hand it’s highly unlikely that Aslan’s work will become the core textbook for any Historical Jesus course at any university. Yet we can be quite sure that The Bible will be a best-seller for years to come. Aslan’s book will pass out of the public’s attention rather quickly, but Bart’s book, with its “basic mistakes on the very sources that stand at the center” will affect (or afflict) a generation of students. And while “anyone on the planet is free to write a book” on the Bible, only a handful of respected scholars will get the backing of Oxford University Press. Someone who is not an expert makes mistakes – lots of mistakes, and often serious mistakes. And the problem is that the person doesn’t even know it. I don’t think Aslan knowingly wrote anything he didn’t think. The problem is that he doesn’t know the field well enough to know where there are gaps in his knowledge, or where he has accepted incorrect information that he has heard or read one place or another. Posted on 2014-03-15 18:30:52 GMT+0000 by Tim Widowfield. This entry was posted in Biblical Studies and tagged Aslan: Zealot, Bible, Documentary Hypothesis, Ehrman: The Bible, Hebrew, Julius Wellhausen, Reza Aslan. Bookmark the permalink. I found your explanation of various translations of YHWH to be fascinating. Thanks. But I did find your ridicule of Ehrman bit laborious — perhaps your intended audience is actually your buddies who love jabs at Ehrman and not us normal folks. This excessive nitpicking severely distracts from your helpful insights and corrections to folks like me. But again, it seems your intended audience is in-house folks. This excessiveness is no more clear than when you quote Ehrman and put a “sic” for his duplicate use of “instead”, I wonder — “Really, is Tim trying to get me to totally ignore his may points. He seems most interested in just pickiness.” I see mistakes in all sort of great writing. Or where you spelled the Oxbridge Posh word “excursus” with an “i” — or perhaps that is a British spelling. Your pointing out Ehrman’s jab at Aslan is a good point- and you are giving it back to him, though it feels like you could have done it with a little less drama — but that is me. Instead, what would be cool to do is make a separate blog called, “ Mistakes in Ehrman’s “The Bible”. Do very succinct (not bitter) corrections in each SHORT post. Then, I imagine University teachers (Christian and non-Christians alike) would reference the blog when they assign the book. That way, you could reach many folks outside your inner circle. This is great stuff, I’d like to see it reach more. or something like that. The “Y” to “J” issue is immaterial in the argument — it was the vowels that were important. I know NO Hebrew, so that part of the explanation was hard for me to understand. 1. It’s always a tricky business tagging any quote with “sic.” Maybe I should just quit using it altogether. I actually added it late in the writing process, while reading it aloud. I thought I had made a mistake in copying the text, went back, and realized that the two “insteads” were really there. 2. Thank you for the corrections. I’m pretty good at proofreading other people’s writing, but when I proofread my own stuff, my brain tends to auto-correct while I’m reading it. 3. As far as maintaining a list of errata for Ehrman’s The Bible, I’m not convinced of its utility. These people do not take kindly to corrections from the peanut gallery. And I’ve found that even the most gently worded suggestion that a scholar is wrong will be interpreted as hostile and mean-spirited. As far as “drama” goes, you may have a point. However, when you read has much of this stuff as I have, you tend to get fed up when scholars play the credential card. Actually, it’s YHWH. Technically, there are no “correct vowels,” because saying the divine name aloud became taboo very early on. Presumably, during the First Temple period the high priest, at least, knew the original pronunciation. And centuries before that, uttering the name probably wasn’t prohibited, since there are so many theophoric names that contain the divine name or parts of it — for example, Elijah (Eliyahu). The puzzle of how to pronounce the word is compounded by the fact that well before the vowel points were invented, Hebrew had adopted the concept of using existing consonants as vowel indicators. For example, when the “H” (“he”) appears at the end of a word, it is silent, but indicates a vowel sound. When you read names like Isaiah, Judah, Jeremiah, etc. That’s what you’re seeing. In fact you can see this practice in the spelling of “Jehovah.” The final “H” is what we call a matres lectionis. The question would be whether the first “H” should be pronounced as a consonant, starting a syllable, or as a vowel indicator, ending a syllable. The reconstructed “Yahweh” presumes that the first “H” ends the first syllable — YaH. Again, I presume that’s a typo, but you’re essentially correct. A Jewish reader of Hebrew would never attempt to read the YHWH aloud, because it’s forbidden. So what we’re dealing with is the fact that non-Hebrew readers may have been unaware of the practice of qere, and tried to pronounce YHWH with the vowels for Adonai. However, to be fair, when the Masoretes added the vowels to YHWH, they didn’t put a note in the margin, which was apparently the normal practice for qere. See page 43 of the Moore article for a discussion of how the error occurred and was propagated. I’m not sure if I answered you question, so let me know if anything isn’t clear here. Thank you for taking my comments so well. I totally sympathize with your anger at snobby scholars. Interesting, and though still over my head, that helped a bit. Leaving out the parenthetic in this statement, isn’t it essentially right? Is there a way to follow comments by e-mail? I like it when people offer corrections for what I’ve written. Please don’t stop! I don’t think so. The invention occurred in Latin and was borrowed into German and then English. Recall as well that Ehrman is not just wrong about “J” being the English equivalent of “Y,” but he also wrong in his implication that “YHWH” became “JHWH” when English readers misunderstood how to pronounce the tetragrammaton. That is not what happened. Bart’s HuffPo article in 2012 for Did Jesus Exist was my first introduction to an actual debate about whether Jesus existed or not. But even I knew at the time that his arguments in that short piece were shoddy. Looking into Bart’s work more closely, I found something that shocked me at how brazenly apologetic an atheist NT scholar could be. Reading about his NT textbook, Bart said he put the Gospels before the Epistles because he wanted the students to know something about Jesus before they read what Paul had to say about him. Unbelievable! So while I can respect he has done some great individual works of scholarship, I would never trust him in general any farther than I could throw him. That article led me to Vridar and the great writing you and Neil do, as well as a good commenting section. Thanks all, including Bart! You never know where that “nudge” will come from. For me, it was reading Freke and Gandy’s The Jesus Mysteries. I knew at the time it wasn’t a good book, but it made me go look everything up that I thought I knew. It was that process that made me realize I needed to re-evaluate the major theories and the evidence behind them. That’s probably worth a post of its own. Well I know you were being facetious, but actually Bart’s ignorance about how YHWH was to be pronounced by the reader in Synagogue really made my head hurt and my brain explode! I knew that even from my University days and I was a civil engineering student. I got my factual information about the two pronunciations from, of all sources, that fundamentalist crank by the name of Herbert W. Armstrong! That aside, the Moffat Version of the Bible has “Eternal” for the tetragrammatron and HWA popularised this on his radio program. Personally, I prefer “Lord-Eternal” and “Eternal-God” for the alternate pronunciations, in small-caps of course. Gen. 2:4 Telles sont les origines des cieux & de la terre, quand ils furent creés, quand l’Eternel Dieu fit la terre & les cieux. I remember listening to “The World Tomorrow” with Garner Ted Armstrong back in the ’70s. When I heard the Firesign Theatre’s Everything You Know Is Wrong the first time I was blown away by the near-perfect voice impression. Didn’t Bart Ehrman slam Thomas Thompson for daring to speak on the New Testament, when Thompson was an *Old* Testament scholar? And yet Bart appears to think that a New Testament scholar like himself is quite qualified to write on the Old Testament? I would assume the defense here would be that Ehrman’s book is only putting the conventional story about the Old Testament into a textbook form, while Thompson was proposing something unconventional about the New Testament when he wasn’t an expert on it. Since Ehrman isn’t doing anything novel, but just packaging up conventional analysis for a student population, he doesn’t need to be a specialist. That said, it was still stupid – point out the factual mistakes being made. If factual mistakes aren’t being made then it isn’t a lack of expertise that is at issue it’s something else (i.e. that he’s deviating from the accepted interpretation of the facts) and argue against that. Accusations of “this person is not an expert” are only useful if you THEN go on to point out places where their lack of expertise has led to critical mistakes in their argument because their lack of expertise has led them to argue from mistaken premises. If you can’t do that then shut up about their expertise and address why their analysis is mistaken. If you can’t do that, explain what the accepted analysis is and explain why it’s a superior model that provides better explanatory power for the facts. And if you can’t do that then you are most likely wrong and you need to seriously consider the idea that the other person’s analysis is better than the conventional wisdom whether or not you like it. In an ideal world, a scholar would recognize his or her weaknesses and do a little extra research. And before publishing a book, our ideal scholar would ask real experts to look at it. The mistakes I’m finding are in keeping with the superficial understanding of the Hebrew Bible and Judaism that people focused on the NT often make. You might wonder why the publisher would ask Bart to write a textbook on the entire Bible. It’s fairly simple: Bible Buffs Buy Bart’s Books. McGrath recently showed a marketing sticker that showed how “cheap” the book is compared to the competition. So, yeah, it’s “product,” and the price-point and the author’s recognizable name ensure that the publisher will move that product. Oxford University Press is going to sell truckloads of ’em! Jer: Accusations of “this person is not an expert” are only useful if you THEN go on to point out places where their lack of expertise has led to critical mistakes in their argument because their lack of expertise has led them to argue from mistaken premises. Ehrman’s criticisms of Aslan were mostly spot on. Some of the mistakes were just weird. You wonder how they got published in the first place. Don’t forget — many journalists who take their jobs seriously are capable of writing decent works on subjects they’re initially unfamiliar with. They do research. They ask the experts. They write, rewrite, and rewrite again. These are skills any reasonably intelligent person can learn and master, but it takes a certain amount of humility to put them into practice. I believe it was Zindler who said he was dismayed that despite having given books to Ehrman and making himself available for questions and clarifications, Bart never contacted him. The problem doesn’t arise from a lack of competence, but rather from a surfeit of vanity — not ignorance, but arrogance. I have noticed that most scientists don’t have this attitude that, because they were experts 10 years ago and have taught the thing for years since, they now know it all. I have asked several PH.D.s this week, with research in string theory or cosmology, whether they understand the latest discoveries about gravitational waves from unimaginably early in the universe printing patterns of differing polarisation on the cosmic microwave background radiation and so providing evidence for the theory of inflation. They all say, without shame, no I do not understand it – I must study and read about it when I have the time. Like monks who just keep tolling the bell Biblical historians go on about the apocalyptic prophet or other Jesus they have taught for years, use the outdated criteria, and despise any thought of checking their facts or rethinking their ideas. Perhaps the effort they have put into their existing teaching notes feels to them like proof that any other approach is contemptible. I suppose other historians will eventually look at the rational arguments and move to a new consensus, leaving the biblical historians behind. A first class degree and a career in a scientific subject like this would also explain his ability to argue his case with confidence, regardless of whether it is correct or not. Bart Ehrman’s research is amazing. Did you know that the Gospel of Mark is our earliest account of the trial and crucifixion of Jesus? Doesn’t the Gospel of Mark (our earliest account) portray Jesus as calming a storm – something only a god can do? isn’t that an early source? The Gospel of Mark is late, not early. ‘Our earliest account’ is full of ‘later pious expansions’. All these history students going to university under the naive impression that the same document can’t be both early and late. Bart will learn them!